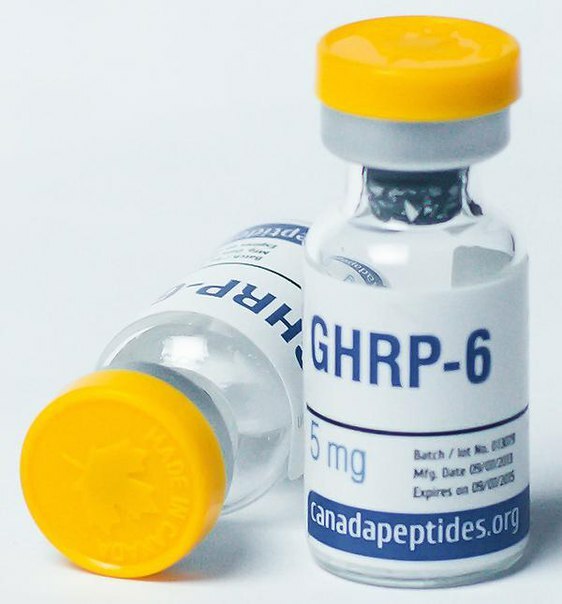 GHRP-6 (Hexarelin) is a peptide that stimulates the secretion of a natural hormone and is produced in the human body. This drug was produced for medical purposes to treat a hormone deficiency that is responsible for growth. The drug is widely used by athletes. It has a strong anabolic effect, which is responsible for fat burning processes. It attracts bodybuilders who get fantastic results. The indications of increasing your own hormone increase from 2 to 6 times. The gap between the indicators depends on the individual physiological characteristics of the organism. A large number of studies of this drug suggest that it is quite effective and safe for health. By its properties it is equivalent to GHRP-2. However, GHRP-6 does not increase appetite, nor does it increase hunger. The combination with CJC-1295 or GHRP-2 will also help to increase the effect. Enter the drug intramuscularly and subcutaneously. For proper administration, consult a specialist. The drug appeared in pharmacology relatively recently, but it was in high demand among athletes. He attracts his indicators of strength, endurance and dry mass. For muscles and relief, the drug fits best. Combination with CJC-1295 will increase the efficiency by at least 2 times. The peptide works slower than steroids, but the mass will be of higher quality and will last for a long time, unlike steroids, which need to be repeated after half a year due to the disappearance of the result. Peptides are absolutely safe for health, which is also a big plus for the body. The positive quality of the drug is the lack of artificial influence. It produces its own growth hormone, which affects the body as a whole and is much cheaper for you. For maximum effect, a standard dosage is recommended, which is 1-3 μg per kg of body weight. A smaller dosage will have a worse effect on the production of your own hormone, and a larger dosage will not increase its amount. Injections are administered subcutaneously. Such a procedure will increase the production of somatropin and begin to work in half an hour. After 4 hours it is normalized to the original. That is, injections should be done every 4 hours. The recommended daily dose should not be increased. For maximum effect, combine with proper diet, productive workouts and good rest. The drug GHRP-6 has become very popular among athletes, therefore it is used in practice stably.